New book, 235 pages. More than 3000 years ago a village was established on the west bank of the Nile. Situated amid a barren and arid landscape, it housed the workers who created the tombs of the Pharaohs in the Valley of the Kings. Stonemasons, painters sculptors, quarrymen and scribes lived with their wives and children in the village, and worked closely together in the sacred valley. 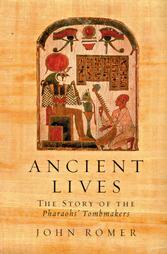 Through excavation and the study of ancient texts, the author has recreated the villagers lives in intimate detail. He tells us of their quarrels and rivalries, sickness and health, marriages and deaths, of the effects of flood, pillage and war. This is a fascinating account of the day to day lives and thoughts of ordinary people who created some of ancient Egypt's finest treasures.